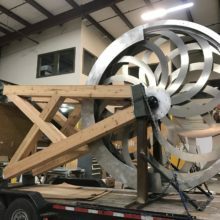 Americlock, a premier clock making, was recently contracted to build a custom clock tower for the record-breaking Silver Dollar City Time Traveler attraction in Branson, Missouri. 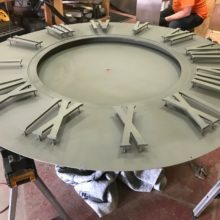 As a company specializing in custom clock manufacturing, we design, build, and install unique time pieces and this is certainly one of them! Herschend Family Entertainment, known as one of America’s largest owned family-owned themed attractions companies, reached out to Americlock with a challenging project and a tight deadline. 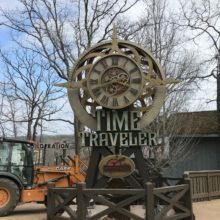 To compliment the inauguration of the only spinning roller coaster of its kind in the United States known as the “Time Traveler,” the Silver Dollar City project needed a centerpiece for the attraction. 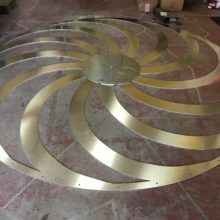 Americlock created an iconic clockworks system featuring moving fan blades with night-time illumination. From start to finish, the project was completed just in time for the ride’s opening within just eight weeks, practically a record in its own right. 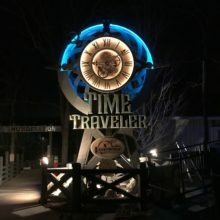 At 2.5 tons with a width of more than 13 feet and 20 feet tall, the time piece provides an impressive focal point for the ride, reflecting the roller coaster’s many record-breaking accomplishments with its custom aged scenic paint and three-dimensional appearance. When considering a landscaping or architectural feature, a custom clock tower can be the answer. In addition to serving a useful time keeping purpose, clock towers create a gathering point and act as landmark within the context of a campus, municipality, university, or a landscape. 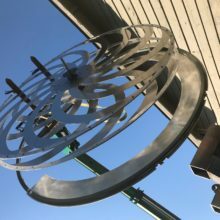 Contact Americlock about your custom clock tower design idea and we’ll help you through the design, fabrication, and installation process!